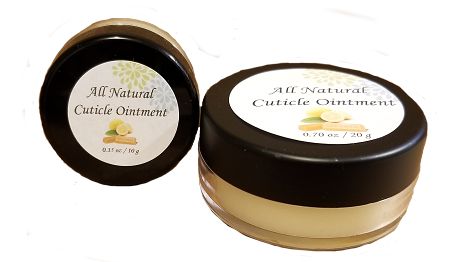 All Natural Cuticle Cream. Works wonders on dry, cracked nail beds. Use twice daily or whenever your cuticles need some extra nourishing and intensive moisturizing by applying a dot on each cuticle. Massage in with the opposite hands ringer finger with small circles all over the cuticle and nail area. Use a Q-tip, plastic spatula, toothpick or even a clean lip brush. This balm will remain fresh 12 months, but I guarantee you are going to like the results so much it will be gone before you know it, it disappears fast! Perfect for those cold, dry windy days, or if you have your hands in water throughout the day. Your manicurist is going to be asking how you are keeping your cuticles so soft. Works great on hands, elbows and heels too.